1. Kneeling stool offers excellent ergonomic support and ease of use. 2. Adjustable knee height allows for multiple users. back, shoulders and neck to relieve strain on the lumbar muscles. 4. 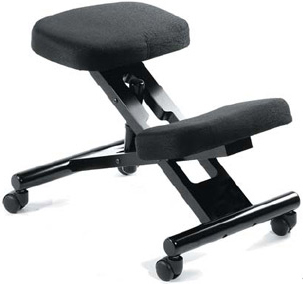 Black fabric seat and knee platform provides comfort for long periods of time. 5. Hooded double wheel casters. 6. Available in black stained wood with black fabric. Boss B247 has wood frame and manual lift. But Boss B248 has metal frame and gas lift. Question: Is this available with leather seat? Answer: Unfortunately this chair comes only in fabric covered seat and is not available in leather.